Even good things can be improved! This is the case with our successful SPANNTOP system, which we have consistently reworked, and which is now being replaced by a brand new generation of chucks: SPANNTOP nova. 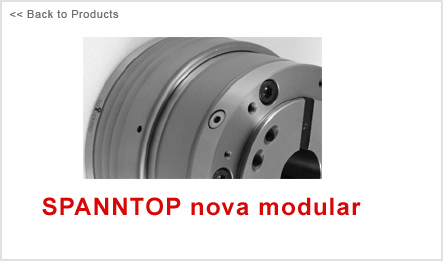 This development represents more than 20 years of SPANNTOP experience. And this experience utilizes all the advantages of the latest machine tools. The components are not only optimized for balance quality and having an extended guide length, the clamping length of the work pieces is also significantly greater. This chuck is designed for maximum RPM and holding power at an ideal concentricity, and it is even more rigid, more precise and has a longer service life than its predecessor. The clamping head is pulled directly into the chuck body, which enormously increases the accuracy and rigidity.